Dr. Energy Saver is a home energy audit dealer network established in 2009. Our headquarters is located in Seymour, CT and we have dealers throughout the nation. Below is some contact information to get in touch with the headquarters directly. 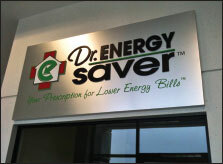 Looking for a specific Doctor Energy Saver location or a Home Energy Audit?